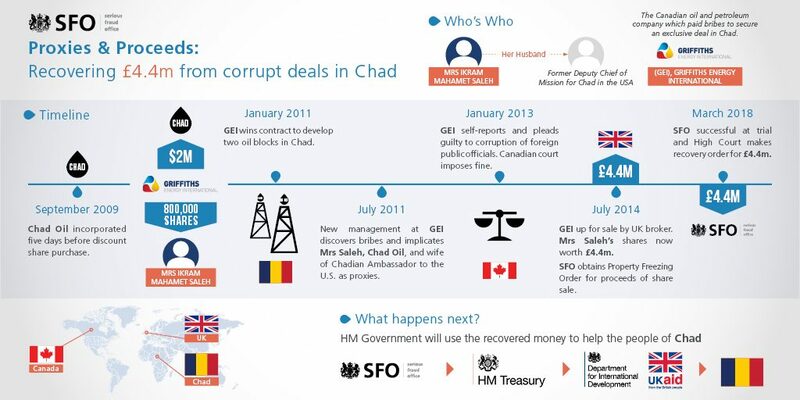 Securing exclusive contracts with corrupt deals, Griffiths Energy bribed Chadian diplomats with discounted shares deals and ‘consultancy fees’ using a front company ‘Chad Oil’ – which was set up just five days before agreements were signed. ‘Chad Oil’ was a vehicle used by senior diplomats at the Chadian Embassy to the United States to facilitate a deal which saw the wife of the former Deputy Chief, Mrs Ikram Saleh purchase 800,000 shares at less than 0.001$CAD each, later selling them for significant profit. Griffiths later self-reported these and other transactions as bribes intended to illegally secure commercial interests in Chad and pleaded guilty to corruption charges brought by the Canadian authorities. Following the takeover by Griffiths Energy by a UK corporation and share sale via a UK broker, the corrupt proceeds entered the UK’s jurisdiction and the SFO began civil recovery proceedings to secure the £4.4m share sale profits from Ikram Saleh. The matter was brought to a three-day trial at the High Court which today granted the SFO’s order to the value of £4.4m, the first time money has been returned overseas in a civil recovery case. “Today’s ruling follows four years of tireless efforts by the SFO to recover the proceeds of this corrupt deal for oil in Chad. The recovered money will be transferred to the Department for International Development (DFID) who will identify key projects to invest in that will benefit the poorest in Chad. This follows two SFO landmark cases where funds recovered in bribery and corruption prosecutions were returned and reinvested in the country. When senior executives at Smith & Ouzman were convicted of foreign bribery in 2016, the SFO’s confiscation order paid for seven new ambulances in Kenya, while the Deferred Prosecution Agreement against Standard Bank involved payment of £4.9m to the Government of Tanzania. The trial followed a number of previous appeals against the Property Freezing Order which can be found here. More information about the SFO case against Chad Oil is available here. More details are also available on previous cases involving compensation paid to Kenya and Tanzania. Once received, the £4.4m will be held in trust by the SFO and entered into the Consolidated Fund, after which DFID will identify key established projects to invest the money in. The defendant has a maximum of 21 days in which to appeal today’s ruling. The SFO was represented in court by David Quest QC and Fiona Jackson. Mrs Saleh was represented in court by Jonathan Ashley-Norman QC and Nick Yeo.